If Hollywood remakes this Korean thriller, there will be a temptation to call it “Habeas Corpus.” In this case, the National Forensic Service had the body of industrialist Yoon Seol-hee and then lost it. Basket case copper Woo Joong-sik assumes someone stole it, but there are suggestions of something even more sinister afoot in Lee Chang-hee’s The Vanished (trailer here), which screened during the 2018 Fantasia International Film Festival. Yoon’s body disappeared during a brief blackout, when the night watchman was also knocked out cold. The slovenly, booze-smelling Woo will lead the investigation. That ought to be good news for the prime suspect, Park Jin-han, Yoon’s prenupped, trophy husband, but Woo doesn’t have much left to lose. When he starts uncovering circumstantial and physical evidence linking Park to his wife’s murder, he defies orders from above to release his suspect. In fact, Park did indeed do it—or so he thought. He conspired with his lover Hye-jin to kill Yoon with one of her company’s own experimental drugs. However, the mysterious calls and texts they both start to receive makes him suspect Yoon was playing him all along. Or maybe option C.
Strictly speaking, Vanished is not a horror movie, but Lee definitely serves up plenty of atmosphere and general foreboding, along with a dark and stormy setting. Throughout most of the film, he plays it coy regarding Yoon’s disappearance, but when the truth comes out, it is rather sly. Kim Sang-kyung is an absolute fount of entertainment as the rumpled and grizzled Woo, like a bitter, half-drunk Colombo. Kim Kang-woo is all kinds of despicable as Park, but he makes viewers feel for him a little (in spite of ourselves), when his world really starts to implode. Of course, he withers next to Kim Hee-ae, who truly channels her inner Bette Davis as Yoon. As an added bonus, Kim Ji-young lends the film some presence and authority as Dr. Cha of the forensic agency. Vanished is a dark and twisty thriller that should also appeal to horror fans as well. Lee keeps us off-balance throughout the first two acts. Even when we start to piece together the big secrets during the closing twenty minutes or so, it is still rather fun to watch Lee’s revelations. It is a lean and eerie take-no-prisoners thriller that translates really easily for foreign markets. 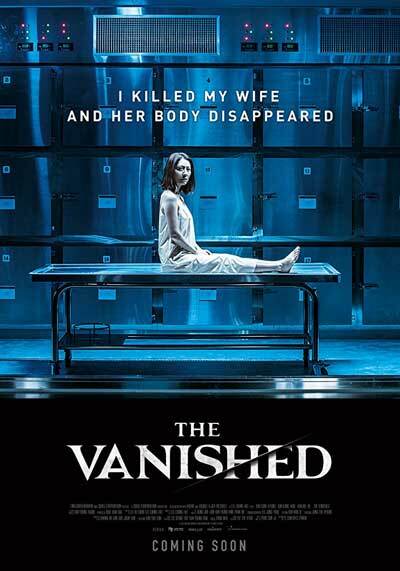 Highly recommended for genre fans, Vanished had its North American premiere at this year’s Fantasia. Japan Cuts ’18: We Make Antiques!